One of the goals of the Career and Technical Education program at Jefferson-Lewis BOCES is ensuring students receive a first class education that prepares them for a future career. That means collaborating with our education and industry partners in the community. 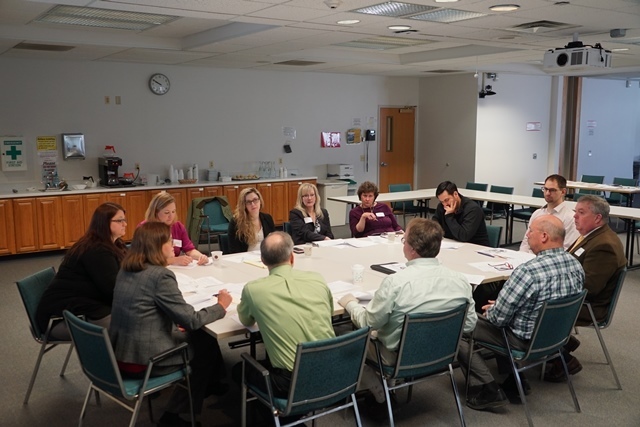 Those collaborations occur every year in the form of external review teams that recently met at both the Watertown and Glenfield campuses to examine several of our CTE program. All of the Career & Technical Education programs offered by BOCES need to be formally approved every five years. This year, six CTE courses are up for re-approval. They are 3D Modeling & Design, Carpentry, HVAC/Plumbing, Motorcycle, Marine & Power Sports, Electrical Wiring and Visual Communications. Engineering & Design, a new program that started at the Sackett Tech. Center in 2016/17, was ready to be approved. The process is done in five steps. Focus is on improving the program(s) in question to better serve the region and students. The first step is inside the classroom. Teams of CTE staff map the curriculum, align it to state and industry standards, and then review the seven required elements of each program. They collect evidence of their implementation and data about the program. An advisory committee for each program meets yearly to review the curriculum and resources. The next step involves academic teachers from the component districts in what is called Applied Academics Day. Teachers and students in the highlighted programs present the concepts they have learned in their classes, highlighting how Math, English and Science are applied. The group of assembled teachers reviews the curriculum for academic content and standards, and then provides feedback to the instructors. Once completed, the important process involving the external review team begins. The duties include determining that the programs meet industry and state standards. The team also reviews certification of teachers, a three part national industry-based technical assessment, articulation agreements with post-secondary institutions, inclusion of work based learning, an employability profile, and procedures for collecting and reporting data and other information about the program. The external review team must also find proof that an extensive internal and external review process has been followed. Several steps remain in the approval process. The materials will be presented to the BOCES Board of Education at a later date for their approval. The Board will verify that each program has undergone a rigorous review process. The application is then submitted to the New York State Education Department for approval. We would like to thank all our partners in this process on behalf of our area students.